BURROUGHS, JOHN. (1837-1921). American naturalist and essayist who influenced the American conservation movement. SP. (“John Burroughs at ‘Slabsides’”). 1p. Large oblong 4to. (West Park), N.d. (after 1895). 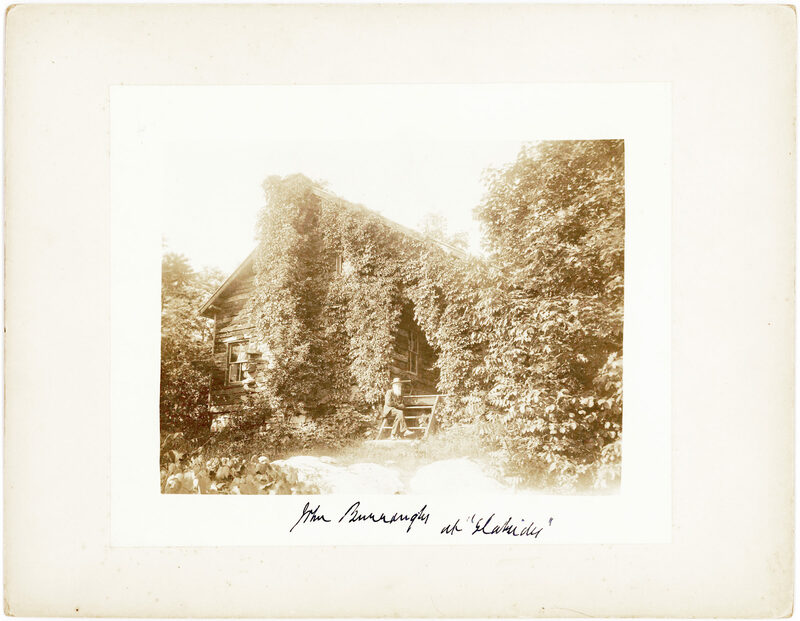 A sepia photograph of Burroughs sitting on the steps of his summer cabin Slabsides, signed and identified by Burroughs as such on the lower blank margin. Born on a farm in the Catskills, Burroughs was an ardent lover of nature who expressed his feelings through his writing. Burroughs’ professional writing career began in 1860, with the publication of his essay Expression in the Atlantic Monthly. 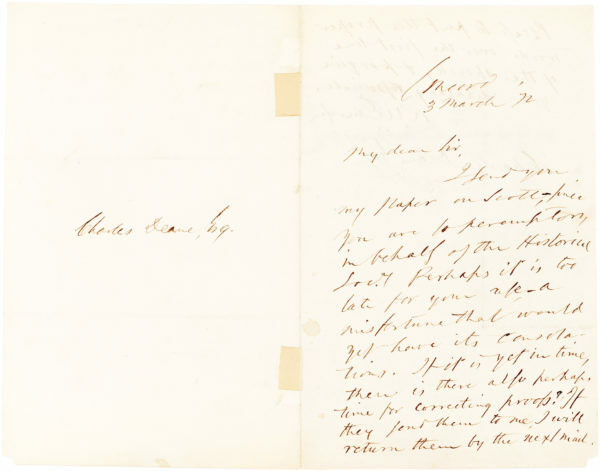 Editor James Russell Lowell initially thought it had been plagiarized from Ralph Waldo Emerson who was incorrectly credited as its author in subsequent publications. Encouraged by his close friend poet Walt Whitman, Burroughs published a collection of essays, Wake-Robin, in 1871 while working as a federal bank examiner in Washington, D.C.
Burroughs’ work combined observations of nature with philosophy, religion and literature and made him a popular figure during his day. 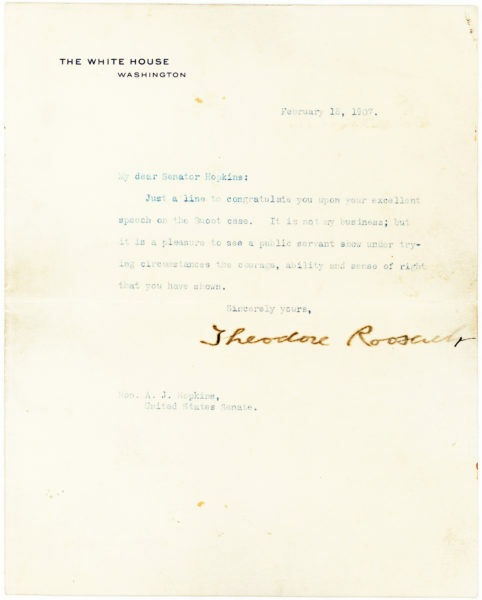 Among his fans was Theodore Roosevelt who, after meeting him in 1889, became a close friend for the next three decades. Burroughs’ essays also appeared in such collections as Locusts and Wild Honey, Squirrels and Other Fur-Bearers, Songs of Nature, Ways of Nature, and Camping and Tramping with Theodore Roosevelt. In 1873, Burroughs purchased a farm in the Hudson Valley town of West Park and built an estate called Riverby, where he continued to write and cultivate various crops. In 1895, he constructed Slabsides, a one-room Adirondack-style cabin used as a summer residence. Visitors to Slabsides included his close friend Roosevelt, naturalist John Muir, and industrialists Henry Ford, Thomas Edison and Harvey Firestone. Image size is approximately 8¼” x 7¼”, on photographic paper measuring roughly 8” x 10”. Mounted on an 11” x 14” piece of stiff paper board. In overall lovely condition.